Do you want straight, beautiful teeth, but dislike the thought of traditional braces? Now with your Wurtzel Family, you can achieve the straight, uniform teeth you’ve always wanted without obtrusive wires or brackets. Our Invisalign treatment is a clear alternative to traditional orthodontic treatment. Instead of traditional and cumbersome permanent metal braces, Invisalign utilizes a series of clear plastic aligners that will gently push your teeth into a more uniform position. Invisalign braces are virtually undetectable. You’ll be able to talk and smile without worrying about drawing unwanted attention to your teeth. Traditional braces can make patients feel anxious or self conscious in public. Patients who choose Invisalign often feel more confident in social situations. Unlike traditional braces, Invisalign braces are completely removable. You’ll never have to worry about diet restrictions. You can remove your Invisalign braces before you eat. Because Invisalign braces are removable, they make it easier for patients to care for their teeth. Patients can take out their aligner before they brush and floss. Using Invisalign, patients can track their progress every time an aligner is switched. You’ll be able to see and feel the results of your treatment throughout the entire dental service. Invisalign treatments are typically shorter than traditional orthodontic treatment. Patients can straighten their smile with Invisalign in as little as a year and a half. Traditional braces treatments typically take a couple years to complete. Traditional braces with wires require many appointments with your orthodontist. Invisalign treatments require less appointments, and can save patients time and expense. 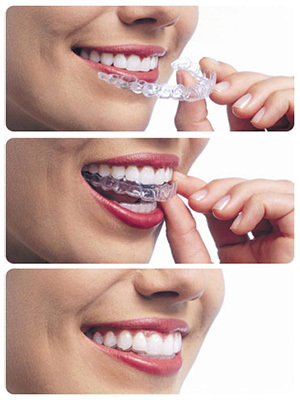 Invisalign braces are perfect for patients with minor misalignment issues. To find out whether or not Invisalign will best meet your needs, call us at our office today. We would be happy to schedule an appointment or consultation, or to answer any questions you might have.